Bob Trotman ’69: Business As Usual The sculptor's latest exhibit runs through Dec. 8 at Davidson College’s Van Every/Smith Galleries. North Carolina-based sculptor Bob Trotman opened a new exhibition at Davidson College’s Van Every/Smith Galleries on Oct. 19. The exhibit, “Bob Trotman: Business as Usual,” runs through Dec. 8. 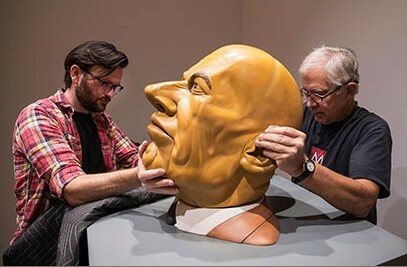 In February 2018, the show moves to the Gregg Museum of Art and Design, NCSU, in Raleigh, North Carolina. If you can’t make it to either of these shows, you can see Bob’s work in the permanent collections of Renwick Gallery, Smithsonian Institution, The Virginia Museum of Fine Arts, The North Carolina Museum of Art, The Weatherspoon Museum of Art, The Mint Museum of Art, The Museum of Art of the Rhode Island School of Design and The Museum of Art and Design in New York.